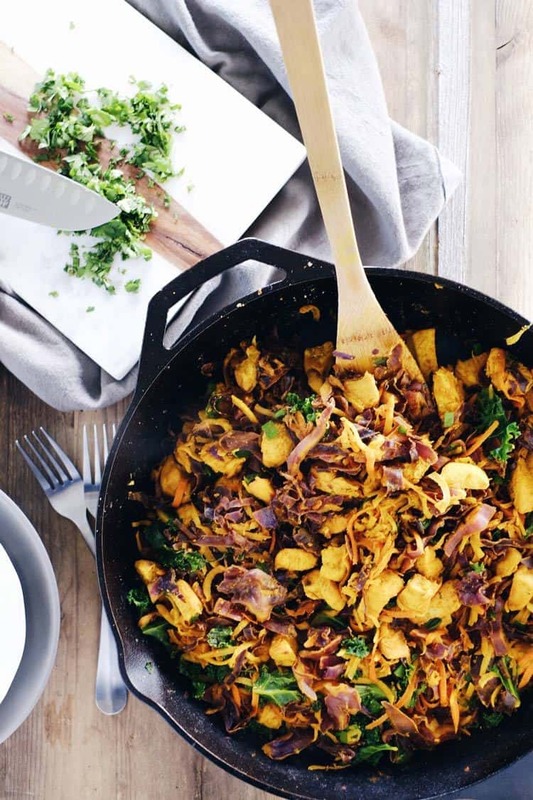 The ease of a one pan dish really can’t be beat, and the fact that this one pan turmeric chicken skillet is a tasty and healthy way to reduce inflammation as well makes it a no-brainer. Give it a try! Serve it with some rice and enjoy! 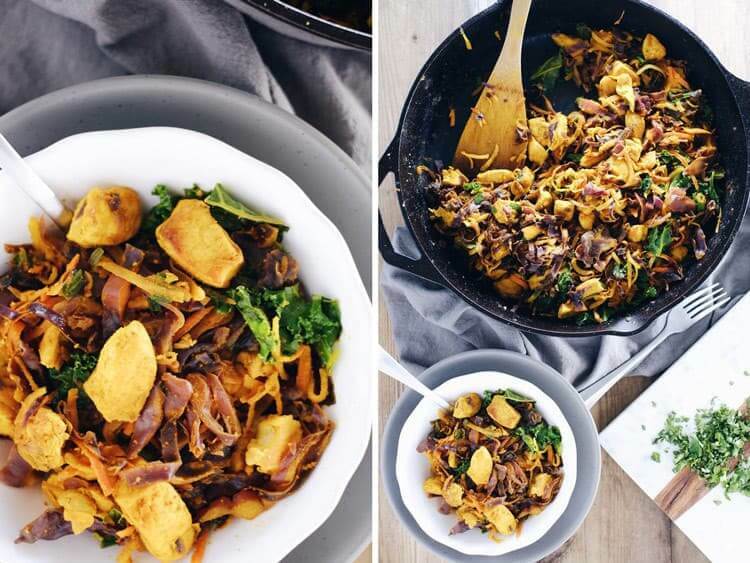 Add more turmeric into your diet by making this one pan turmeric chicken skillet! Your body will thank you! Let us know how it goes by leaving a comment below. Also, take a photo and tag us on Instagram @realsimplegood, so we can check it out! 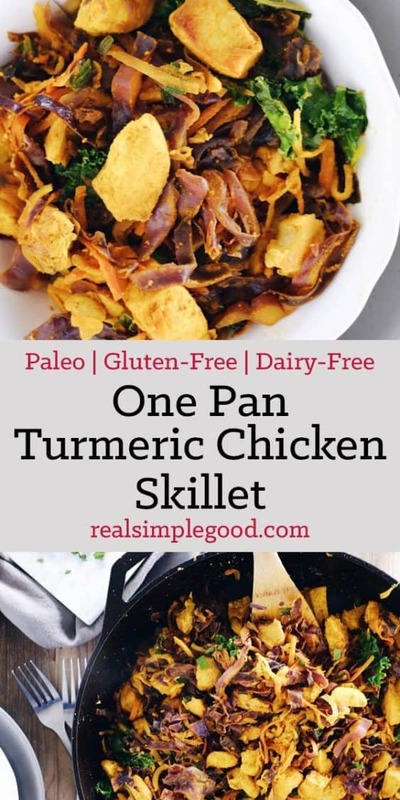 This one pan turmeric chicken skillet has a unique blend of flavors and is a Paleo + Whole30 way to enjoy chicken with powerful anti-inflammatory benefits. Start by cutting up chicken into small pieces. In a large skillet over medium heat add oil. Once hot, add chicken and cook until chicken is starting to brown, about 6-8 minutes. While chicken is cooking use food processor to chop cabbage and grate carrots. Or hand chop and grate. Once the chicken is about cooked, add about half the cabbage to pan and once it starts to cook down, add the rest. Allow cabbage to cook down and soften. Add turmeric, garlic powder and sea salt. Mix to evenly combine and add the carrots, green onions and spinach or kale. Stir until everything is mixed and turn heat down to low. Simmer for 2-3 minutes. Remove from heat and serve over optional white rice with chopped cilantro on top. Enjoy! 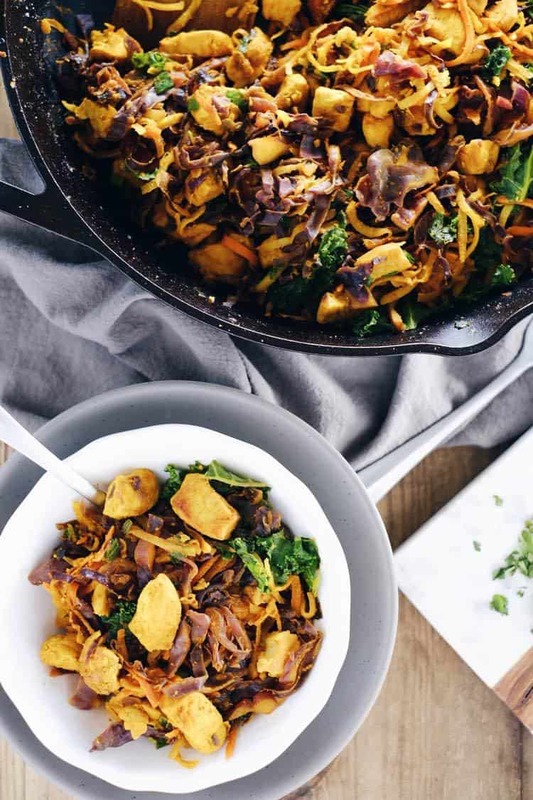 I LOVE this recipe – however, carrots are not Keto. I substitute with cauliflower rice! 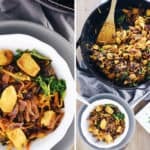 Glad you love the recipe and found a veggie that works for you and your Keto needs! Thanks for the feedback and sorry to hear that you didn’t like the recipe.